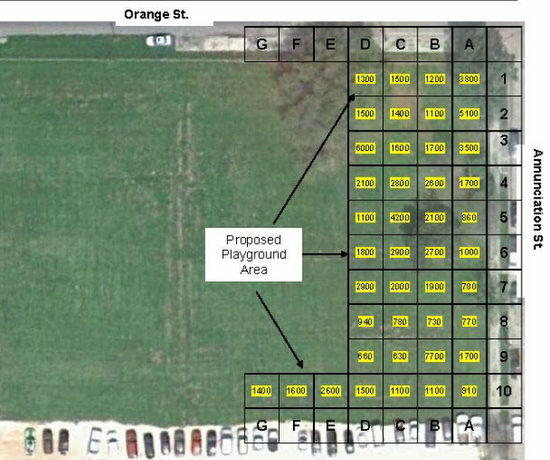 The site proposed for Audubon’s temporary campus has lead contamination in the soil of the playground area exceeding federal standards by 10 times or more, prompting some parents to insist the entire site have the lead removed before their children arrive next fall. Audubon’s Broadway Street campus is slated for a renovation project that will require a temporary campus for students for two years and, unable to find an existing building that would serve the purpose, officials are considering building modular buildings on a vacant lot in the Lower Garden District. The site previously held several houses, and OPSB consultants told parents in late March that their demolition probably left the soil contaminated, prompting the need for lead testing that was already underway. In a March 31 report included in a May 9 update on the project on the Orleans Parish School Board website, investigators said they found lead levels in the soil ranging from 660 to 7,700 parts per million in every tract of the playground area they tested, well in excess of the 440-ppm federal standard for play areas or even the 1200-ppm standard for non-play areas. The investigators’ initial recommendation was for either short-term remediation in the playground through planting fresh sod atop the contaminated soil, or for more permanent solutions such as soil replacement or a concrete covering. The OPSB consultants conclude in the report that they will follow the recommendations, and are waiting on specifics from the lead investigators. Short-term remediation of only the playground strikes a group of Audubon parents as an insufficient solution, however, and they are asking the school in an online petition to employ the full remediation measures across the entire site. About 80 electronic “signatures” were listed on the petition by Monday evening. Orleans Parish School Board member Lourdes Moran of Algiers, an Audubon grandparent, told WWL News that the schoolchildren’s safety will be ensured. On a somewhat related note, will the Uptown Messenger be reporting on the lead remediation at Daneel Playground? The only mention of this in the Times Picayune was that the process is apparently not in the hands of the City, but the Friends of Daneel. Is any work actually going forward or is the group in over their heads? I have a hard time with the argument the board member gives stating “We have no options.” That is untrue. The renovation of the Broadway campus, while need, is not imperative or an emergency situation that would support moving children from a lead free/remediated location to one that has not been properly remediated. The renovations planned will be wonderful when complete, but they are not mandatory for the school to continue to operate. The Broadway campus is by no means uninhabitable, the planned renovation of the bathrooms, kitchens, cafeteria and increase in space and natural light will be nice, but I can live without them if my childs health will have to be endangered to get them. I also have a very hard time with the statement that they have no options but to make us uncomfortable. The timing of the announcement of the swing space location was completely unfair to parents who do not wish for their children to be at this location – after registration for other schools is closed – it leaves us with little or no options. We were told an acceptable location would be found for our children, this is not it! Now to top it all off they want to skimp on the remediation of the soil. I do not think they would have even tested the soil if they were not really pushed to do so by parents. I am disgusted by OPSB’s actions and the way they have handled this entire situation, not to mention the lack of transparency from Audubon’s own administration. Perhaps this question is somewhat on the fringes of the discussion but I look at the photo with the pattern of lead concentration on the temporary plot and wonder how such a pattern came to be. There is no gradual concentrations that explain what was there before to create the high lead situation. Back in the late 80s we called this sort of pollution, perhaps where a service station once was, a “superfund site,” and it was thought that remediation would be priced in the million$ and isolated from commercial or residential use for years. Today we just dig up a few square yards and the plot is back in shape right away. What changed? It seems to me that there should be some property history research so we have a clue as to why this plot is as it is.